South Korean President Moon Jae-in arrived in Argentina on Thursday for a Group of 20 summit and meetings with various global leaders, including US President Donald Trump. 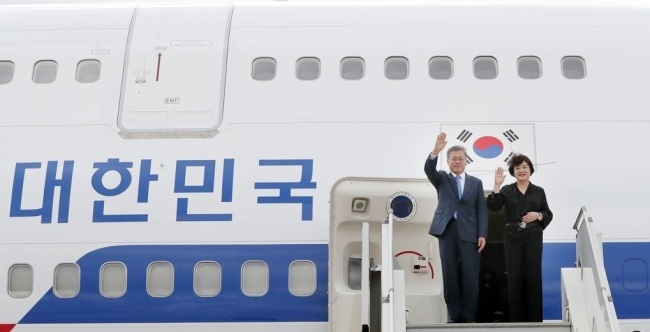 Moon's arrival here followed his two-day unofficial visit to the Czech Republic where he held a summit with Prime Minister Andrej Babis. The president will hold a special meeting with a group of South Korean residents in Argentina later in the day before he attends the two-day G-20 summit from Friday, according to his office Cheong Wa Dae. The South Korean leader is expected to call for global efforts to promote and restore free trade amid a spread of trade protectionism throughout the globe, it added. The annual summit will be held under the theme of "Fair and Sustainable Development." It will also provide a venue for a series of bilateral summits for Moon. He is scheduled to hold a summit with the US president, which will mark the second Moon-Trump summit since September when the South Korean president traveled to the North Korean capital, Pyongyang, for his third inter-Korean summit with leader Kim Jong-un. The meeting will also be followed by Trump's second meeting with the North Korean leader, which is widely expected to be held early next year. Trump and Kim first met in Singapore in June. Moon will also hold bilateral summits with President Mauricio Macri of Argentina, Prime Minister Mark Rutte of the Netherlands and President Cyril Ramaphosa of South Africa.